Planning a road trip to Houston, Galveston, or New Orleans and looking for some fun stops along the way? Check out Beaumont, Texas. There are quite a few things to do in Beaumont, TX, not to mention a lot of history in this little East Texas town. If you’re headed in that direction or looking for a direction to head, here are five things to do in Beaumont TX. Gator Country is an alligator wildlife park located in Beaumont, TX. It’s home to more than 400 alligators as well as Gary Saurage, a conservationist, owner of Gator Country, and the star of CMT’s Gator 911. Gary and his team at Gator Country rescue more than 100 alligators every year from dangerous and unusual places and then deliver them back to the park and/or release them into safer habitats. In addition to rescuing alligators the team at Gator Country spend a lot of time educating visitors on the animals that live on the property. From the moment you step in, the Gator Country team is there to meet you, educate you about the snakes, gators, crocodiles, and even spiders on-site. Not only do they share the basics about the specific species you’re looking at but they invite you to touch them and learn their names, ages, and how they were found/rescued. Gary even does a short Q&A season with guests after their tour; it’s really amazing the amount of information you and your kids leave with. During the summer months, kids can also swim with the small, young gators at Gator Country. (All the alligators have their mouths taped shut, but swimming is at your own risk , as is playing on the on-site playground). 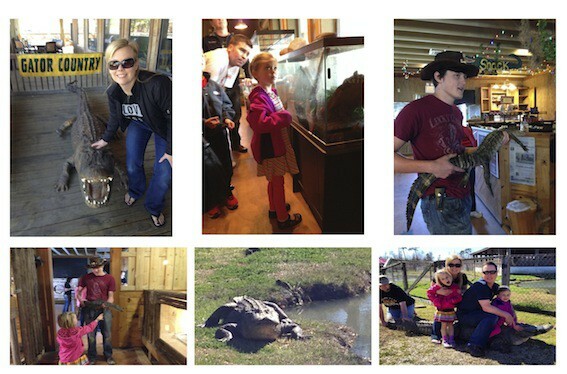 Discover more about visiting Gator Country. Take a step back in time with a visit to the boomtown of Glady’s City, home to the famous Lucas Gusher on Spindletop Hill. Oil was discovered at the Lucas Gusher on Spindletop Hill on January 10, 1901, resulting in Spindletop becoming the first major oil field and one of the largest in American history. A replica of Glady’s City was built in 1975, complete with 15 buildings, including a saloon, post office, general store, and livery stable. Each is filled with objects from the late-nineteenth and early twentieth centuries that depict life during the first Spindletop oil boom. It’s a fun and interactive history lesson for kids and provides a glimpse of what life was like for those living and working at the Spindletop oilfield. Check Glady’s City’s website or Facebook page for dates that you can see a re-enactment of The Lucus Gusher (using water now instead of oil). Beginning in September 2014, the park will do the re-enactment every second Saturday of each month at 2 p.m. as part of its Wildcatter Weekends. Beaumont, Texas is home to the original World’s Largest (Working) Fire Hydrant. 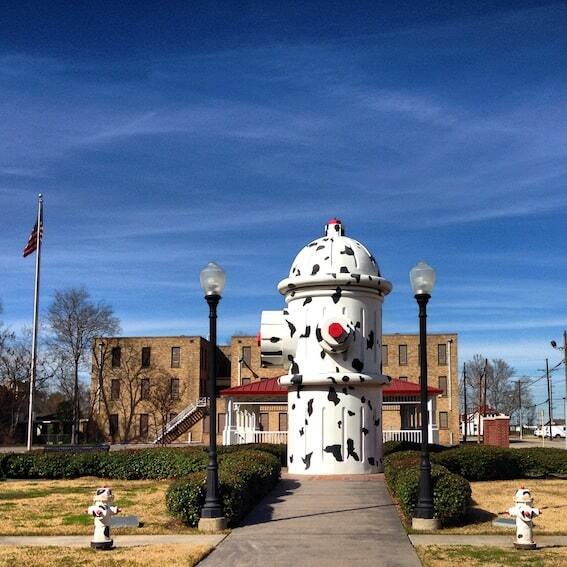 The giant fire hydrant was donated to the City of Beaumont by Walt Disney on March 9, 1999 for the re-release of the animated movie “101 Dalmatians” and is housed outside the Fire Museum of Texas. At the time it was built it was the World’s Largest Fire Hydrant, but it has since lost the title. However, it does work so it can officially be dubbed the “World’s Largest Working Fire Hydrant.” The giant fire hydrant weighs 4,500 lbs and can blast 1,500 gallons of water a minute. The park the giant hydrant is located in makes for a perfect picnic spot either before or after you visit the Fire Museum of Texas. Get a little history lesson and take a short visit to St. Anthony’s Cathedral Basilica. Built in 1903, it was the first Catholic Church of Beaumont, TX, and in 2006, Pope Benedict XVI recognized the historical significance of the cathedral by proclaiming it a Minor Basilica. Beaumont is home to one of only four Minor Basilicas in the State of Texas. Want to see a giant? 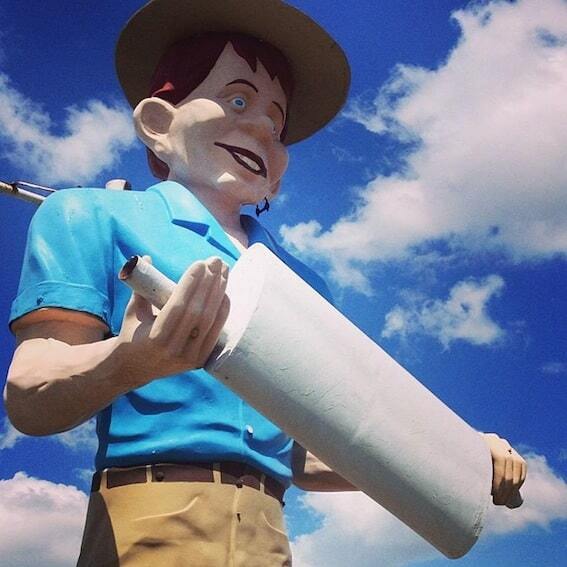 Beaumont can accommodate the request with a visit to see Happy Half Wit, one of four Muffler Men in Texas. Happy Half Wit stands about 25 feet in height and is seen holding a muffler, which is actually rather rare as most Muffler Men are holding an ax, a hot dog, or a baseball bat – or nothing. You can find Happy at Ken’s Mufflers (830 South 11th) in Beaumont, Texas. If you want to grab a sandwich for a picnic, check out Jason’s Deli, the fast, casual delicatessen restaurant chain is headquartered in Beaumont. Better yet, hit Floyd’s Cajun Seafood off of I-70 for some air-conditioning and amazing, fresh seafood. The baked oysters are fabulous! Elaine N. Schoch is an avid traveler who is busy exploring the world, usually with her two kids in tow. She shares more of her adventures, travel advice and tips on Carpe Travel. Stopped in Gator Country just in time for show. It was ok, silly little scare gags & facts that most ppl probably already know. The staff was all nice. Big Al was quite impressive. Not bad, kids will like it.